Bring Joy Guest Post! 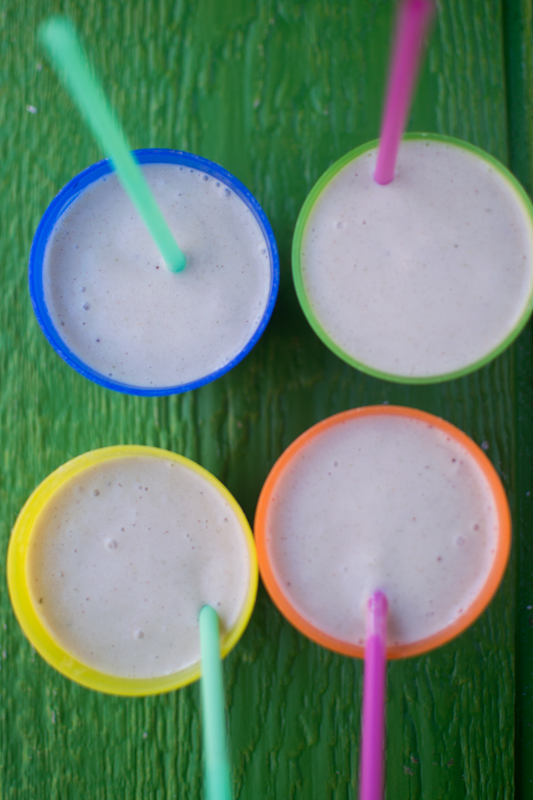 Vegan Egg Nog Milk Shake. Bring Joy Totes. Plus a Bonus Field Roast Celebration Roast. Vedged Out 12 Days of Christmas. So, I can’t even quite remember how Janae and I connected, but it’s been a fast and fun friendship even though I live in Utah and She lives in Texas. See, we’re both Mormon and Vegan (two things that don’t often go hand in hand). Janae found veganism over 7 years ago, while I went vegan just 2 years ago. 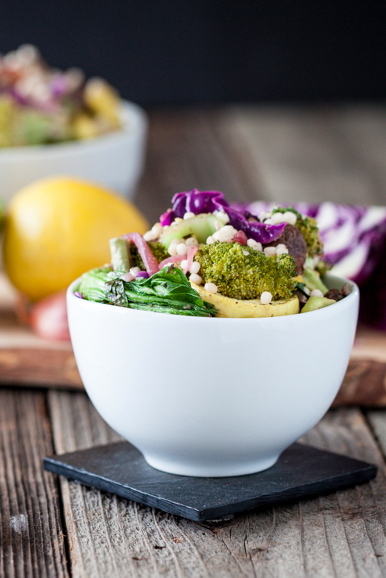 Even though veganism isn’t common amongst members of our faith, we both feel it aligns closely with our church’s Word of Wisdom, which is kind of like a Mormon Law for Health. Interestingly enough, we also both started out our vegan journey with more heavily restrictive vegan diets that eschewed added fats, sugars and sodium. Now we’re both into healthy moderation with all those things. Girls’ gotta live! Her blog, Bring Joy is much fancier and organized than mine! 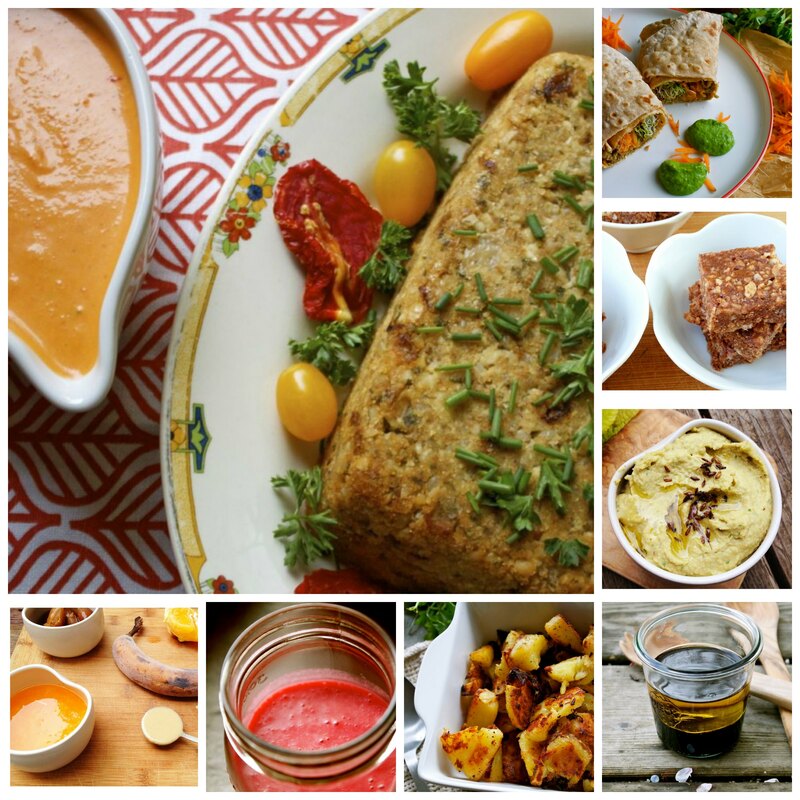 She showcases lifestyle and family posts as well as her recipes (and e-books). Everything she posts is beautifully photographed and mind-blowingly delicious. 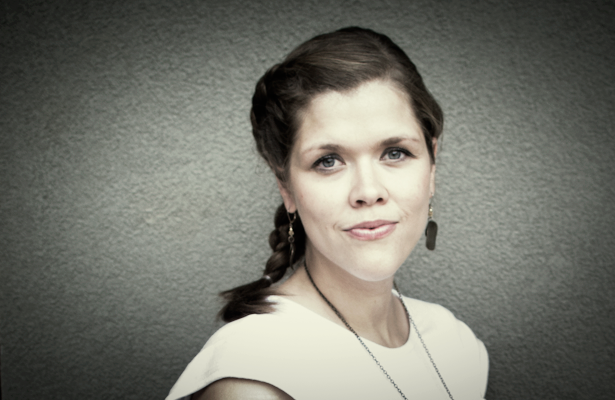 Let’s welcome Janae Wise, the darling heavily pregnant, budget concious, gluten-free, mom and vegan Mormon behind the blog, Bring Joy. The other day I went to Whole Foods. I don’t usually shop there. For one it’s not in my neck of the woods & I’m not into guzzling gas if I don’t need to. But more importantly, my heart starts racing & I approach a near hyperventilative state whenever I look at the prices. Don’t get me wrong–the gluten-free vegan brownies, the chickpea miso, & the organic cultured coconut yogurt certainly does cause m e to think I cannot live without these things–but I simply can’t afford to do too much shopping in that beautiful, beautiful place. And they were on sale. And there was a coupon. So, I scored several boxes for just $1 each–yipee! I love a good deal, don’t you? It’s nice to drink straight up, but I had other things in mind. You see, I have four growing, always hungry, young kids. And when the older ones walk home from school each afternoon they’re especially ravenous. So, it’s my job to figure out how I can easily feed them a nutrient dense, calorie-packed snack. 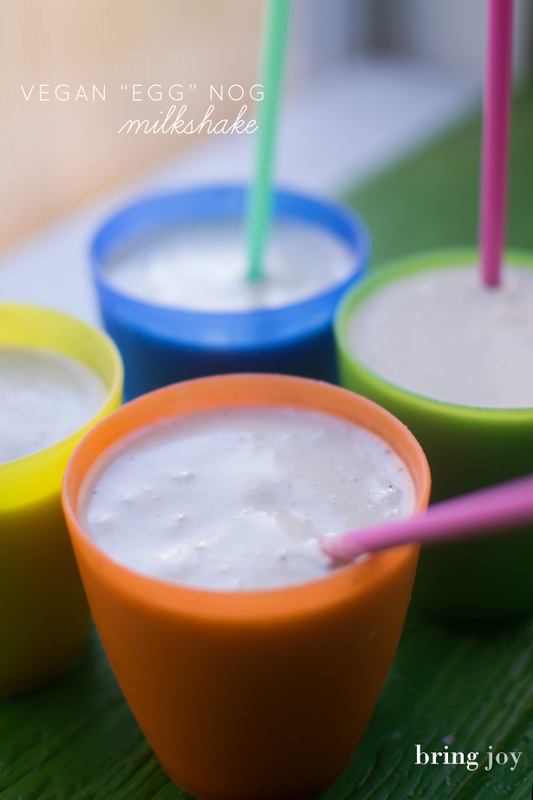 I made this shake for them the other day–packed with lots of good stuff, & calorie dense (though each serving is perfect for an adult watching their calories). The addition of nut butter & pumpkin seeds add some important nutrients for my kids, including fat, protein, zinc & vitamin E.
Put ingredients in blender by order listed & blend until smooth. 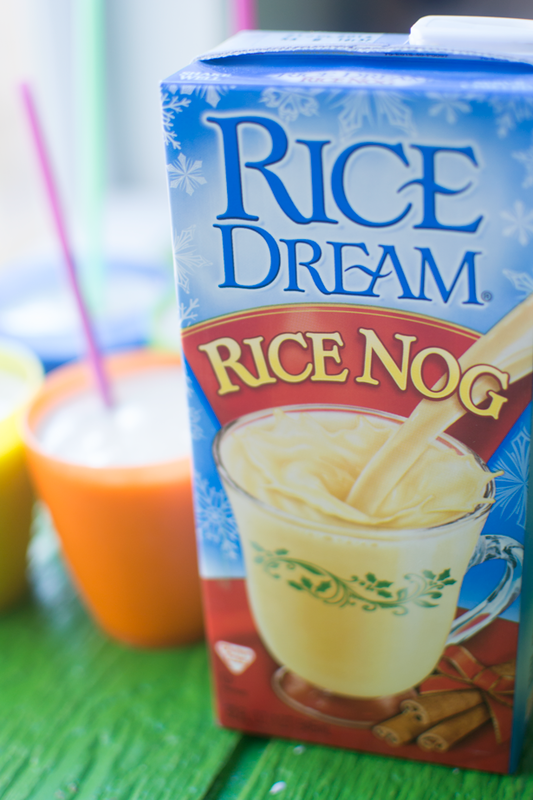 This is isn’t as thick & creamy as my candy cane or pumpkin pie milkshakes (which are more like soft ice cream), but that’s okay–drink with a straw & enjoy! Janae is offering one tote bag for two lucky blog readers! Enter the giveaway! And in the meantime, hop on over to Bring Joy to peruse it’s awesomeness. For a chance to win this amazing Giveaway, Click on the link below to enter the Giveaway! This contest is open to entrants in the USA only! You must also follow this blog by email or RSS feed to qualify. You have until Sunday December 22nd! I will notify the winner by email on Monday the 23rd December. GO!! Bonus Giveaway: Last but not least, Field Roast, the awesome company that makes the best “vegan grain meat” EVAH! mailed me some coupons earlier in the year, so I’m giving away one coupon for a Field Roast Celebration Roast to the first reader to go to my Vedged Out Facebook Page and message me there about how badly they want this Celebration Roast for Christmas! I’ll mail the coupon out to the winner today so that you have time to pick it up before Christmas!!! Day 1: Free Vegan Lifestyle Magazine. Day 2: Free Case of Butler Soy Curls. Day 3: Alternative Outfitters Vegan Boutique $25 Gift Card and Free Messenger Bag. Day 4: Sunwarrior Raw Vegan Protein Powder or Product of Choice Giveaway. Day 5: Tropical Traditions 1 Gallon Gold Label Virgin Coconut Oil Giveaway. 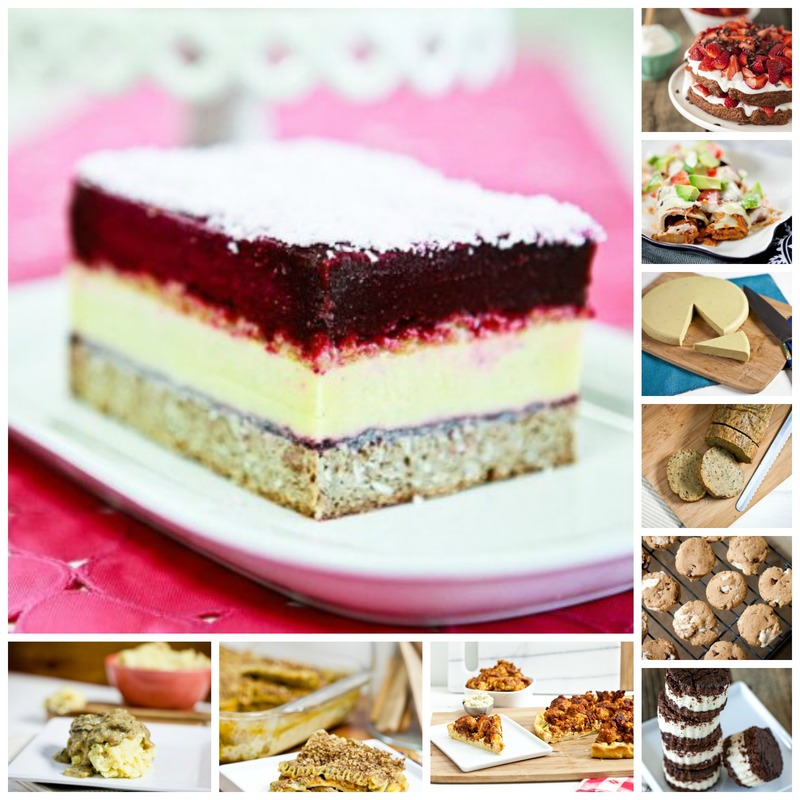 Day 6: Sweet Debbie’s Organic Treats, Allergy Free & Vegan Recipes. Cookbook Giveaway. 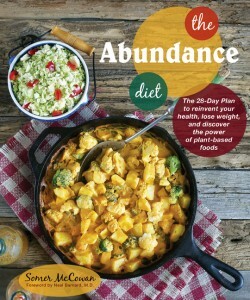 Day 7: Extraordinary Vegan Cookbook Giveaway. Day 8: Emaline Delapaix, Music Download Giveaway. 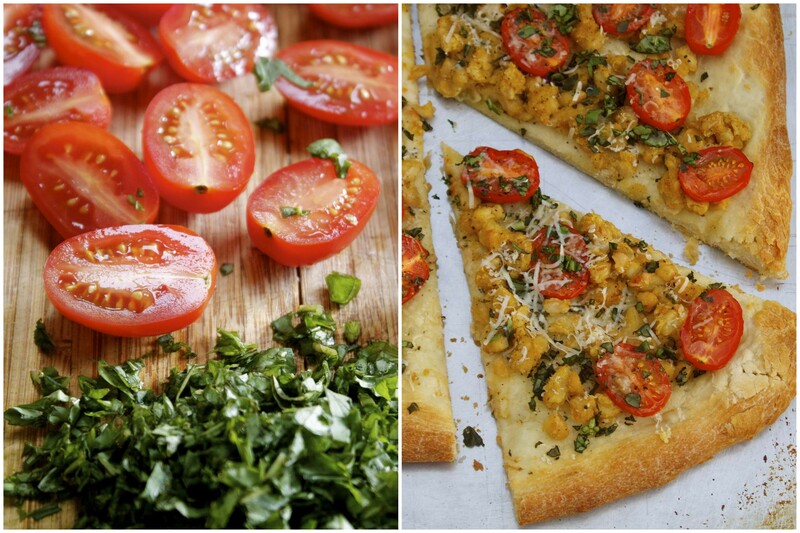 Day 9: Jazzy Vegetarian Classics Cookbook Giveaway. Oil-Free Chocolate Chip Banana Squares. 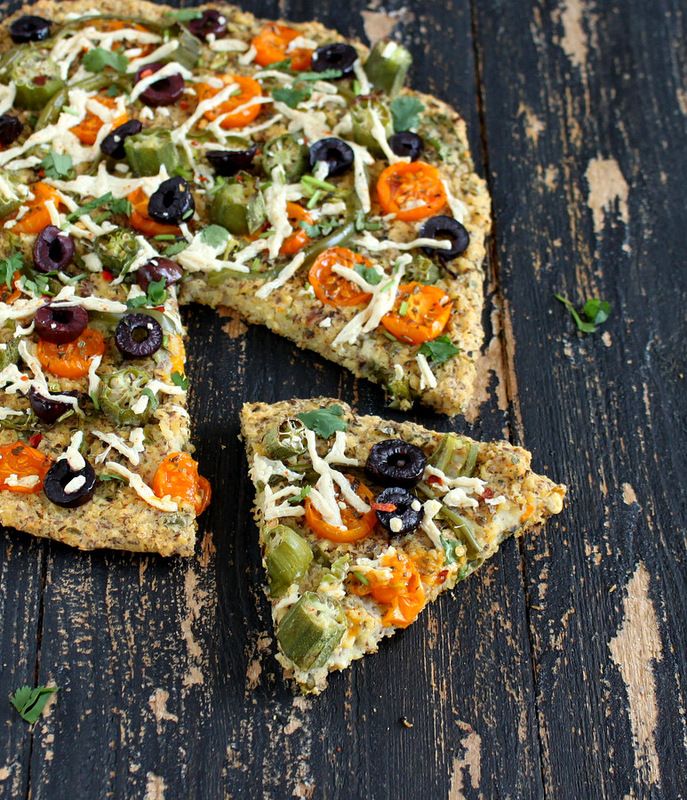 Guest Post from Annie at An Unrefined Vegan + Last Chance for VVP! 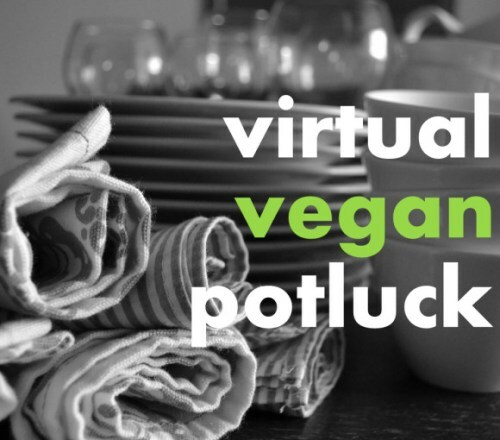 Here’s a final, last minute shameless plug and call for sign ups for the Virtual Vegan Potluck. The potluck is nearly full, so if you haven’t signed up all ready, get in there. Oh, and the founder of the VVP (and my blogger BFF), Annie from An Unrefined Vegan is sharing a guest post with us today. Just looking at this recipe makes me think about all the other luscious desserts in store come potluck time! Let’s give a hearty welcome to Annie and her luscious Oil-Free Chocolate Chip Banana Squares! I think these are healthy enough to qualify as breakfast food! Over the years I’ve made a lot of banana bread from many different recipes. A lot. This one is the simplest I’ve ever made and also the most delicious. While away from home recently, I needed a banana recipe fast so I did a Google search and used the very first listing – from Simply Recipes. I veganized it; traded out the oil for almond butter, used whole wheat pastry flour, added chocolate chips, and then baked it in a square pan rather than in a loaf. This comes together ridiculously fast and is craved by vegans and non-vegans alike (mom and dad, I’m looking at you). Thank you, Somer, for inviting me to share this recipe with your readers and for letting them know about the Virtual Vegan Potluck! I hope that the food bloggers out there will consider signing up for the November 16 event. It’s always a lot of fun and it’s a great way to find new blogs to love and to add delicious, plant-based food to your recipe stockpile. Preheat the oven to 350F and lightly spray a 9″ x 9″ baking pan with oil. In a large bowl, combine the bananas, flaxseed meal, almond butter, sugar, and stevia. Stir well. Add the remaining ingredients and mix until the dry ingredients are fully incorporated. Pour mixture into prepared pan and bake for 35-40 minutes or until golden brown and firm on top. Let cool before slicing. I’m welcoming my incredible friend Richa from Vegan Richa today. Every time Richa posts something, I’m literally salivating and wishing the girl was my neighbor so I could run and grab a bite of whatever it is she’s cooked up. I’m always in awe of her creativity and her crazy good photography. If you love Indian Food, you’ll find every possible variety made vegan on her site. It’s like an Indian Vegan Mecca. But Indian food is just the beginning, the girl is a crazy amazing bread maker (with loads of gluten free options). Last year, for Vegan MOFO, She amazed us all with her incredible pizza theme! That’s right, 20 fantastic pizza posts complete with homemade vegan cheeses, sauces and an infinite variety of crusts. What I love about Richa’s blog is that it’s not just about the food all the time. Richa is a passionate animal activist and within her posts you’ll find statistics, facts and infographics for all the reasons in the world to remove animal products from your diet. Richa is also a cancer survivor. A surgery to remove a tumor in her brain left her with nerve damage to one of her eyes and a prolonged battle with dizziness, balance and vertigo. 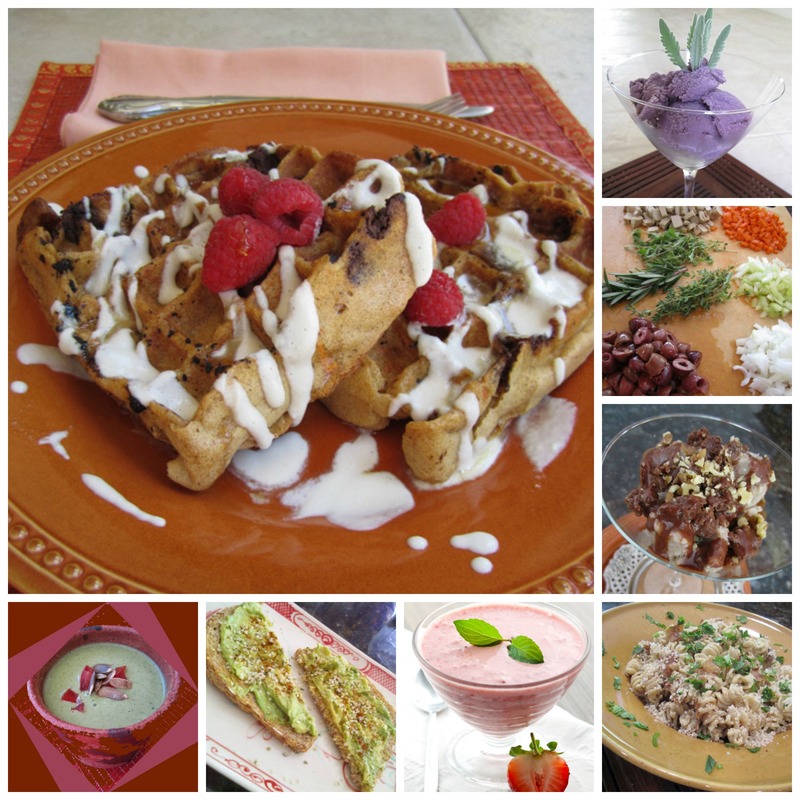 Still she creates all this beautiful food, maintains her amazing blog and fosters rescue dogs. She lives in Seattle with her husband and their adorable fluff ball of a dog, Chewie. I’m incredibly grateful she agreed to guest post here today. For even more fabulous-ness check the end of this post for some of my favorite recipes from her site. Now, check out this amazing Dal! Hi you all. Yippie, I get to bring some Dal to Vedged Out readers today! I discovered Somer via Kristy and have been hooked to Vedged Out since. All the positive energy, amazing food, her personality, keep me coming back for more and more. Wish you a consistent and good recovery Somer. Thank you for opening up your space to us. Beans and lentils, are what we eat pretty much everyday as a part of Indian meals. They end up on the plate usually in a Dal preparation. Some other days in Burgers, pizzas, and more too. Dals are my comfort food, as well as something I would serve as a part of an Indian meal at an event. Amp up the earthy lentils with some specific spices, non dairy milk/butter, different methods of Tadka/Tempering and there you have a delicious hearty bowl of goodness. Today, I am bringing you my Mom’s Dal Makhani. The lentils used are Whole black gram and Kidney beans. Makhani means creamy and buttery. The non vegan version of this Dal contains a good load of cream, ghee(clarified butter) and butter. Mom is now quite adept at vegan-izing things. So when I asked her what she was going to do about the Makhani part, she said just wait and watch and added some almond milk and cashew milk for a similar taste and it worked perfectly. I served the Dal with a teaspoon of Earth balance on top per bowl. And you should have seen the bliss on my Dad’s face:) My omni brother also guzzled down bowls and bowls full of the Dal. If you cant find the lentils used for this Dal, use any similar sized lentil or bean as a substitute from your local store. Substitute brown lentils for black gram, and pinto, black eyed pea, black beans for kidney beans. Whole Urad lentils, Vigna mungo, black gram or black lentil are these pretty lentils which look like black Mung beans. The beans are available as whole or split or split+skinned like most whole lentils in India. Ground into flour or soaked and fermented, urad is also extensively used in South Indian culinary preparations, such as dosa crepes, idli – steamed lentil cakes, vada – savory doughnuts, and Papad/Papadum. Black gram is rich in good protein, vitamin A, B1 and B3 and has small amount of thiamine, riboflavin, niacin and vitamin C in it. Red Kidney Beans are a very good source of cholesterol-lowering fiber, as are most other beans. In addition to lowering cholesterol, kidney beans’ high fiber content prevents blood sugar levels from rising too rapidly after a meal, making these beans an especially good choice for individuals with diabetes, insulin resistance or hypoglycemia. When combined with whole grains such as rice, kidney beans provide virtually fat-free high quality protein. Heat oil. Add cumin seeds and cook until fragrant. Add garlic, ginger, chili and cook until golden. Add onions and cook until translucent. Add tomatoes, asafoetida, garam masala and cook until tomatoes are tender. Add tempering to cooked beans. Add milks, mix well. Cook until the beans are mushy. 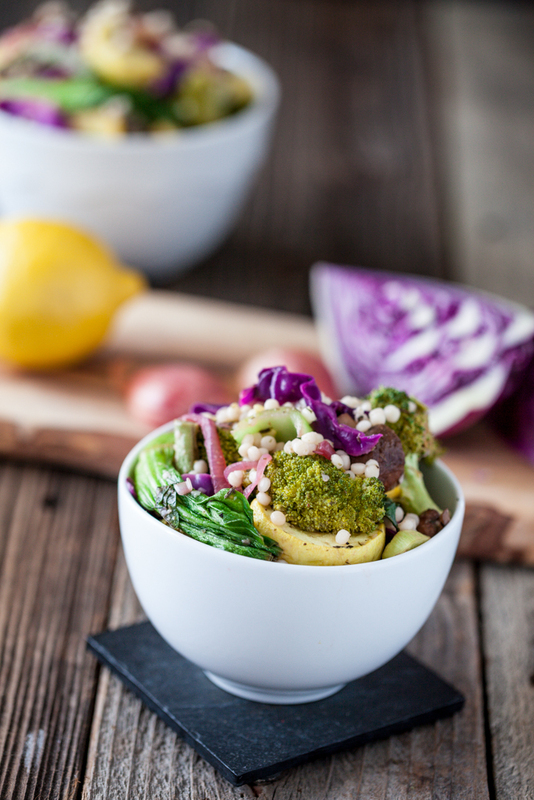 Serve hot topped with a dollop of vegan butter or olive oil. Pressure cook black gram and Kidney beans in 3.5 cups of water with salt and chili powder for 3-4 whistles. Or use a slow cooker to cook both the beans and keep ready. In a large pan, add oil and heat on medium-high heat. Add cumin seeds and cook till they start to change color. Add ginger, garlic and green chili and saute until golden. Add the tomato and cook until tomatoes are mushy. (13-15 minutes till this step). Add the cooked black gram, kidney beans and the water they were cooked in. Add garam masala and the milks. Mix, taste and adjust salt. Add more water if the mixture is too thick. Simmer on low heat till the dals/beans are totally soft and well blended. 30 minutes. Or pressure cook for 1 whistle and then cook on low for another 10 minutes. Top with a small dollop of vegan butter or olive oil and cilantro. Serve with Roti/Naan flatbread or Rice Pilaf or other cooked grains like Quinoa, millet. 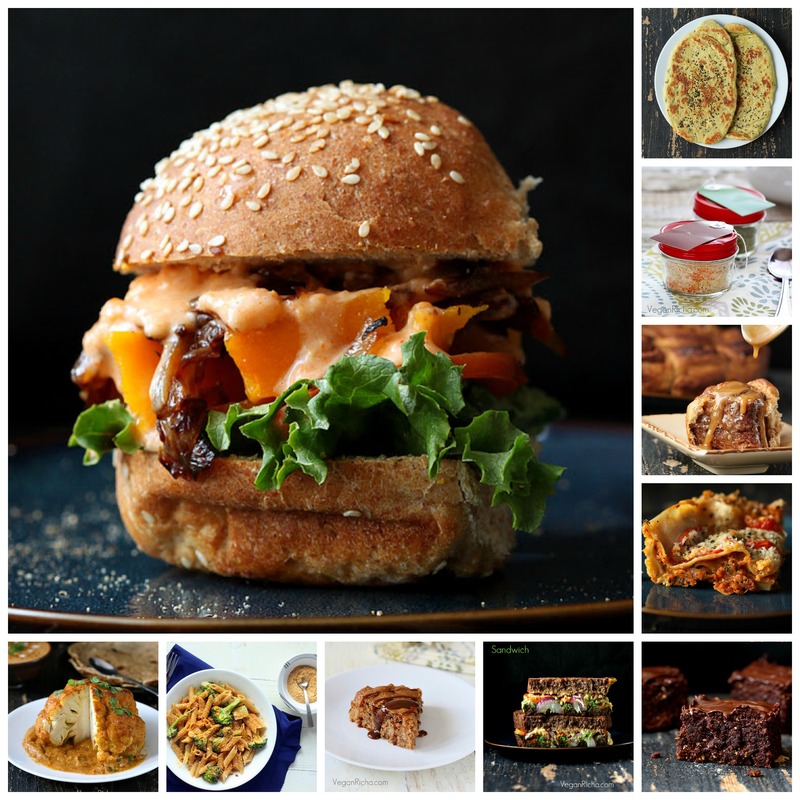 Clockwise: Roasted Butternut Squash Slider, Avocado Naan, Pasta Sauce Mixes in Jars, Cinnamon Rolls, Lasagna Bolognese, Triple Salted Caramel Brownies, Grilled Nacho Cashew Sandwich, Spiced Apple Cake with Salted Caramel, Home Made Doritos Spice Mix (featured on Oprah! ), Whole Roasted Cauliflower in Creamy Makhani Gravy. So, right after I wrote my injury post, the sweet Kelli at Kelli’s Vegan Kitchen contacted me and offered to send me some yoga DVD’s from her practice to enable me to get some healing exercises into my regimen. Being the ratbag that I am, I kind of ignored the message then later tried to tell her I had plenty of other things I was trying to incorporate into my recovery (I have a hard time accepting help, even when I need it). Thankfully she eventually got through to me, mostly because she wouldn’t take no for an answer. At that time I was doing a restorative yoga class at my local gym and some pool running for cardio. I found that even though restorative yoga was good for my soul, it wasn’t really giving me a workout, plus the pool running became more and more difficult when I found I would be in pain for several days after each session. When I tried the yoga class that was the next level up from restorative at my gym, I couldn’t do most of the poses or keep up with the fast pace of the class because of my injury. I ended up leaving after 10 minutes, humiliated and down trodden. Enter Kelli’s miraculous TriYoga DVD’s. I finally decided to give them a go since I figured I had nothing left to lose. Well ladies and gentlemen, they are absolutely perfect for my level of fitness at the moment. Gentle, but challenging. They actually make me feel like I’m getting a workout without hurting myself. And, I can preserve my novice yoga dignity and do them in the privacy of my own home. A couple of weeks ago, I had ladies in my family lined up on our family reunion vacation doing these yoga exercises with me. Yeah, my mom ended up ordering the DVD’s too. Anyway, the moral of this story is that sometimes people come into your life for the right reason at the right time and that sometimes you find help, healing and inspiration where you think you’d be least likely to find it. 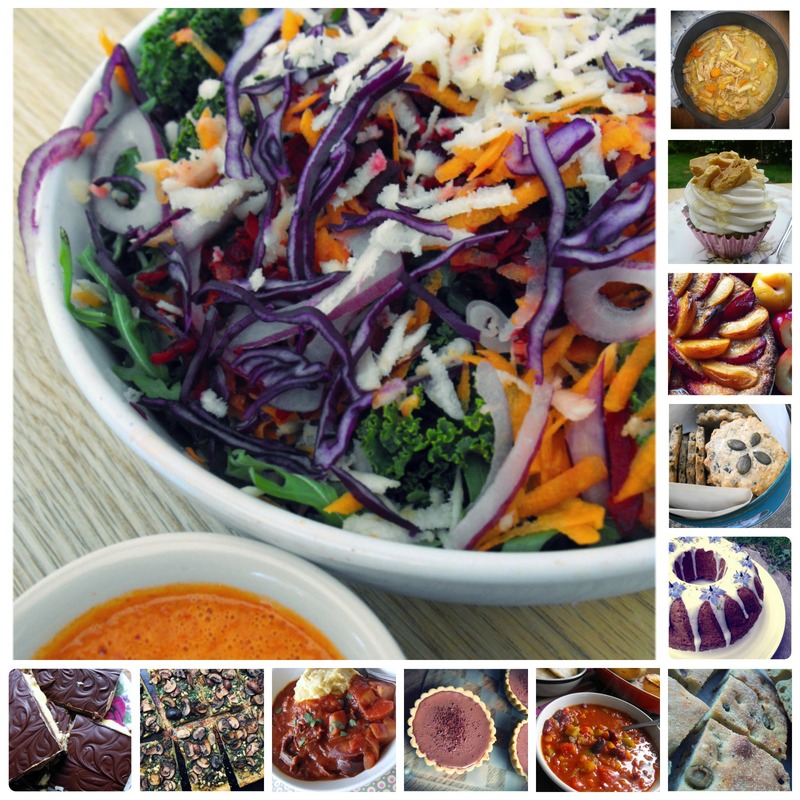 Stay tuned at the end of this post to see some of the delicious offerings on Kelli’s site. Now, here’s Kelli with these amazing Cannoli! Hey Vedged Out readers! I’m thrilled that Somer has invited me to join you all today and share a new recipe. I’ve long been an admirer of hers, and her creativity in the kitchen continually inspires me to new heights. I’m so honored to be in such talented company here. One thing that I’ve learned over the years is that I don’t often actually plan out recipes. 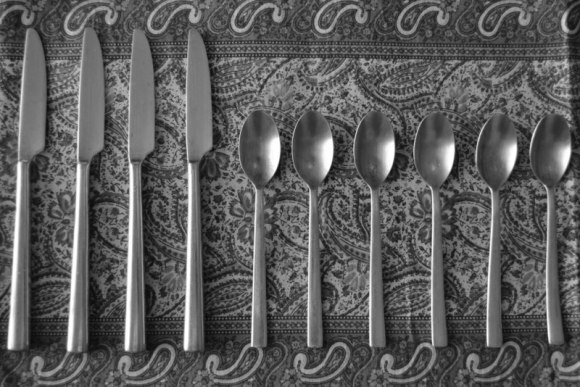 Sometimes they’re triggered by a memory, or a meal that I’ve loved, and sometimes they just appear in my mind fully formed. Amazing how that happens…. This particular one came from remembering long-ago desserts. When I was young, my father was a news photographer for a local tv station. And like fathers do, he brought me souvenirs from the stories that he filmed – from huge Jimmy Carter presidential convention posters, to autographs from every famous person who came into town, to (my favorite) the video he filmed of an open-heart surgery that I brought in to show my sixth-grade class. (It was 1981, and things like that weren’t seen much). And every year around the holidays, he always managed to do a story at a local Italian bakery and brought home the most amazing desserts – what kid doesn’t love a pile of fried dough balls covered with sugar syrup and colored sprinkles? 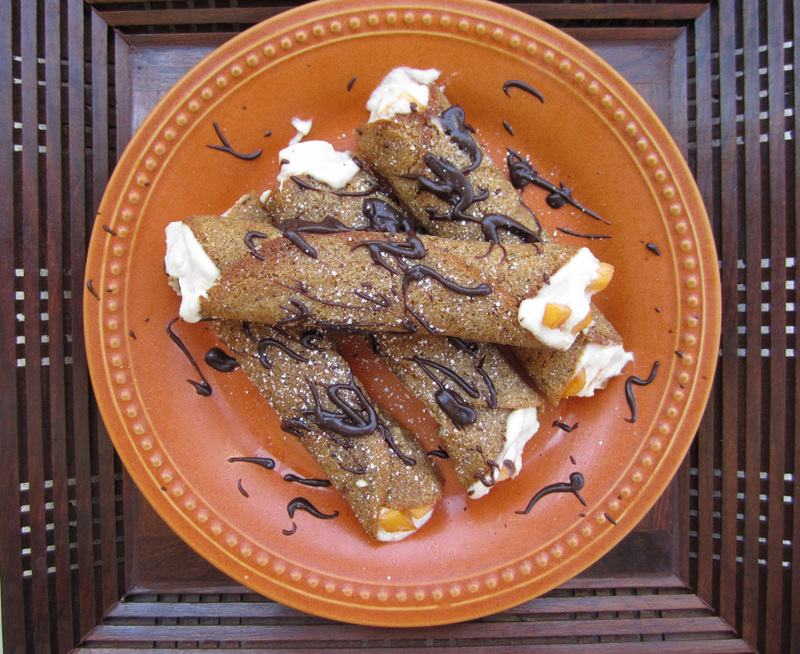 And the cannoli – the most incredible things I’ve ever had. I was recently thinking of those yummy desserts…. 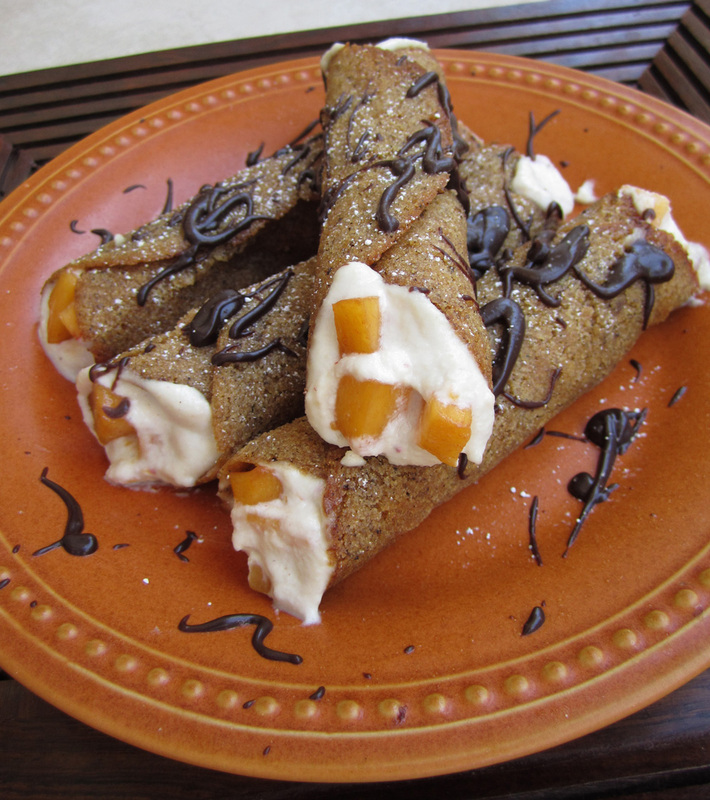 But sadly, I’d not had cannoli since becoming vegan, so I decided that this was the perfect opportunity to create the ideal late-summer version: sweet whole grain shells filled with tangy cashew cream and perfectly ripe peaches, all drizzled with chocolate. And it was so much easier than I’d ever expected! – If you want the delicious cannoli flavors without the bother challenge of rolling the shells, press the baked dough into mini-muffin tins, let cool and then fill, to make mini cannoli cups. – These are best served right away so the shells stay crunchy, but if they do get soft, put them in the freezer for an AMAZING frozen dessert. They taste just like ice-cream cake rolls! 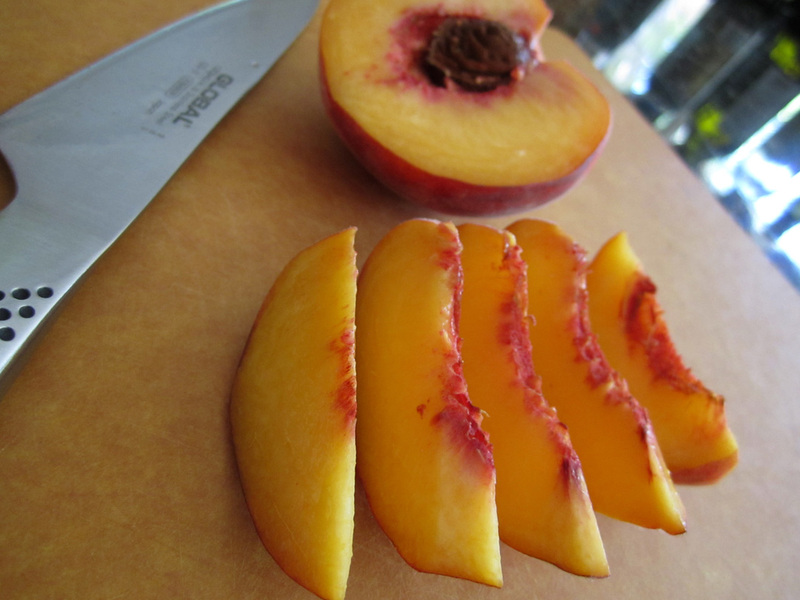 Make the filling first by blending together all of the filling ingredients except the peaches. I made mine more tangy than sweet, so I used 4 tablespoons of water and 1 tablespoon of agave. 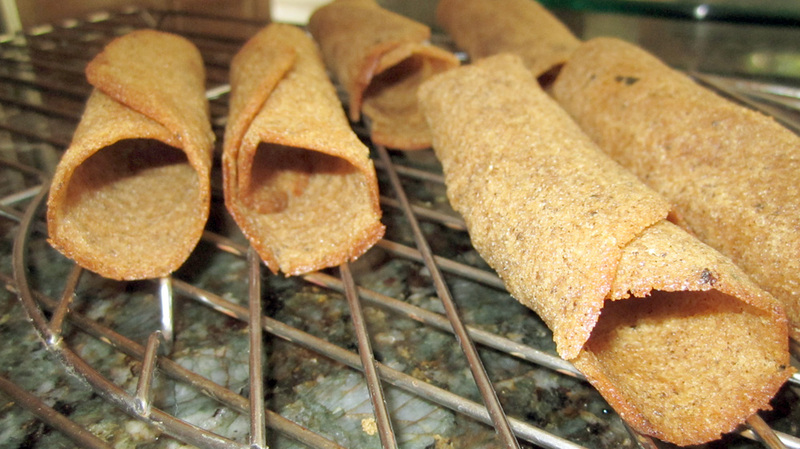 If you prefer your filling sweeter, you can add more agave and reduce the water accordingly. Stir in the diced peaches. Place in the fridge to chill while baking the shells. The filling can also be made a couple of days in advance. For the shells, begin by creaming the Earth Balance and sugar until fluffy. Add the egg replacer and mix well. Blend in the vanilla, balsamic vinegar and flour. Preheat the oven to 375 degrees. On a parchment-lined baking sheet, make thin flat circles of batter 3-4 inches in diameter (I drew circles on the parchment to make sure I had the right size and shape). Do only about 3 at a time. Bake for approximately 8 minutes, until the edges are brown and the dough is cooked through. Let cool for a minute or so, and then while the dough is still pliable, roll it around something about 1” in diameter. 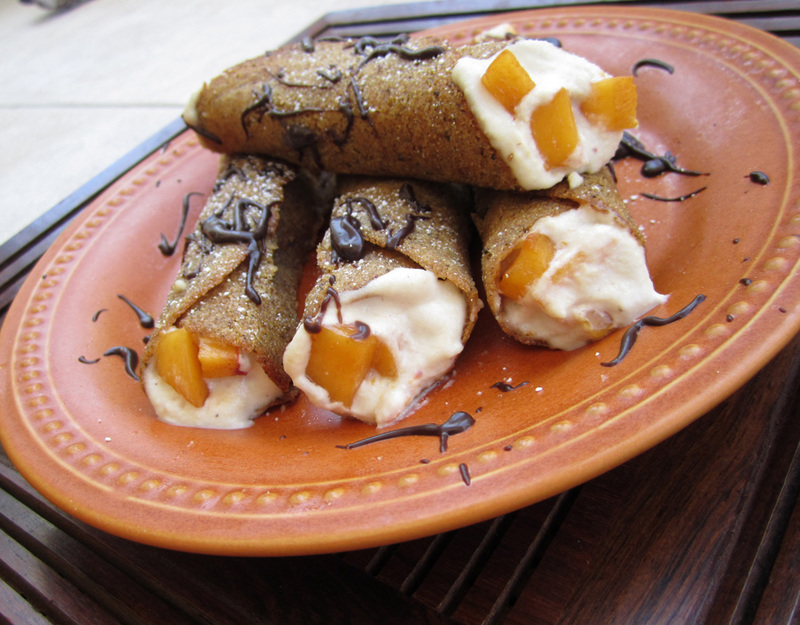 I used cannoli forms for this, but you can also use a bottle neck or the handle from your mortar & pestle. Let it stay wrapped until it starts to cool and holds its shape. Place on a cooling rack until completely cool. Melt the chocolate chips and non-dairy milk together in the microwave or on the stovetop. Whisk together to make a smooth, drippable chocolate. Once the shells are completely cooled, pipe the cashew filling into them using a pastry bag or plastic bag with a hole cut in the corner (make sure it’s big enough for the peaches to go through!). Drizzle with chocolate and a dusting of powdered sugar if desired. Serve immediately. This amount makes about 10 cannoli. 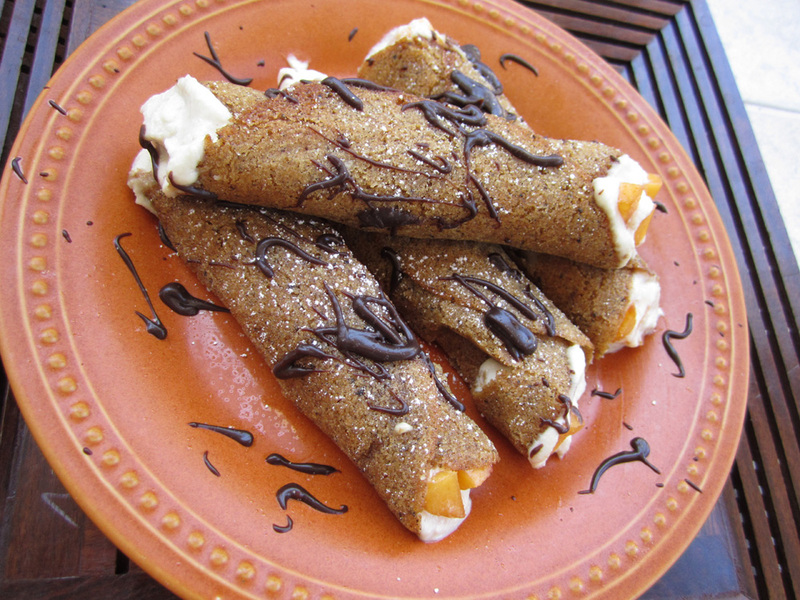 I’ve always thought of cannoli as a special occasion dessert, but why wait? It’s a delicious way to do something special for someone you love. Thanks again, Somer, for having me over today! Kelli Roberts is a skilled Vegan Chef with a certificate in plant-based diet from Cornell University, and is a certified health & nutrition counselor from the Institute for Integrative Nutrition. She has been vegetarian for nearly 20 years and vegan for 11, and has spent hundreds of hours learning about the benefits of a vegan diet and healthful cooking techniques. 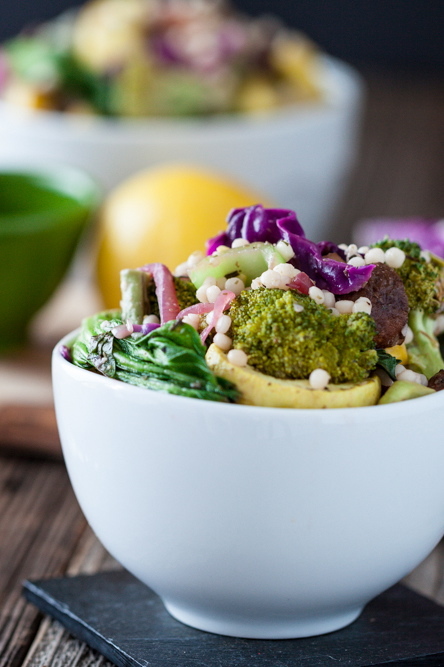 Kelli teaches vegan cooking classes and programs to transition to a plant-based diet (online and in person), and offers individualized nutrition and lifestyle counseling. She is also a Level 3-certified TriYoga teacher. With this training, she leads vegan yoga retreats that offer a complete package of wellness, including yoga classes, group meal preparation, health and nutrition information, and techniques to bring this knowledge actively into our daily lives. To see some of Kelli’s most recent incredible creations on her site, click on any of the following links. Clockwise: Carrot Cake Waffles, Mostly Raw Blackberry Lavender Ice Cream, Rosemary Olive Potpie Turnovers, Raw Chunky Monkey Ice Cream Sundaes, Vegan Pasta Carbonara, Raw Strawberry Ginger Pudding, The Best Avocado Toast Ever and Green Warrior-Goddess Soup. I’m so delighted Kristy from Keepin’ It Kind is sharing a recipe with you today with this guest post. We’ve been blogging buddies from the very beginning (as she mentions below). If you haven’t all ready met Kristy, you need to head over to her site. The food and the photography will dispel any myths that vegans can’t eat a first class gourmet diet. All while using healthy and simple ingredients. This recipe today is one that I know I’d love, since bok choy is one of my favorite vegetables! Keep reading and I’ll share some links to my favorites from Kristy’s site at the end of this post. Firstly, I want to thank Somer for inviting me here today. I have admired Somer since BVO (Before Vedged-Out). As I’m sure you all already know, Somer’s passion is inspiring, her enthusiasm is contagious, and her food is delicious. I know that Somer hasn’t been her normal self due to an unfortunate injury so it is my pleasure and an honor to help her out today. I’d really like to say that in the summer, all of my meals are filled with an abundance of fresh, seasonal fruits and vegetables but that would be a lie. The truth is, in the summer, my laziness is at an all-time high. This laziness creates a little bit of a back-up in my refrigerator’s vegetable drawer. I belong to a CSA and have a weekly box of organic, seasonal, and locally-grown produce delivered to my door. I love this delivery and look forward to it all week, but with my case of summer laziness, a lot of this produce just sits in my refrigerator until I can muster up enough ambition to do something with it. Normally, I use produce from this delivery throughout the week, spreading it out over several meals. A couple weeks ago, however, I realized that I had barely used any of my produce and I had another delivery coming the next day. My dislike for wasting food trumps my laziness any day of the week so I pulled all of the unused produce out and created a super-easy meal packed with seasonal veggies. I roasted up some mushrooms, summer squash, broccoli and green beans. I briefly sautéed some baby bok choy with red cabbage and shallots. 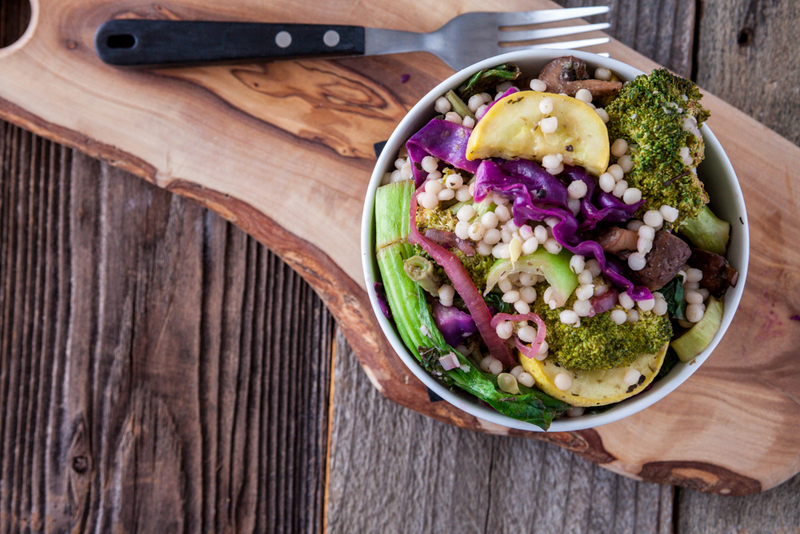 I tossed all of the veggies, along with a grain, with an incredibly simple, ridiculously delicious lemon caper dressing (seriously, it comes together in less than a minute). My husband and I could not get over how good this meal was. We even loved it as leftovers a couple days later. We loved it so much that I had to make it again. Originally I made this dish with freekeh, a grain similar to barley, but for recipe-creation purposes, I chose to use something a little more common. 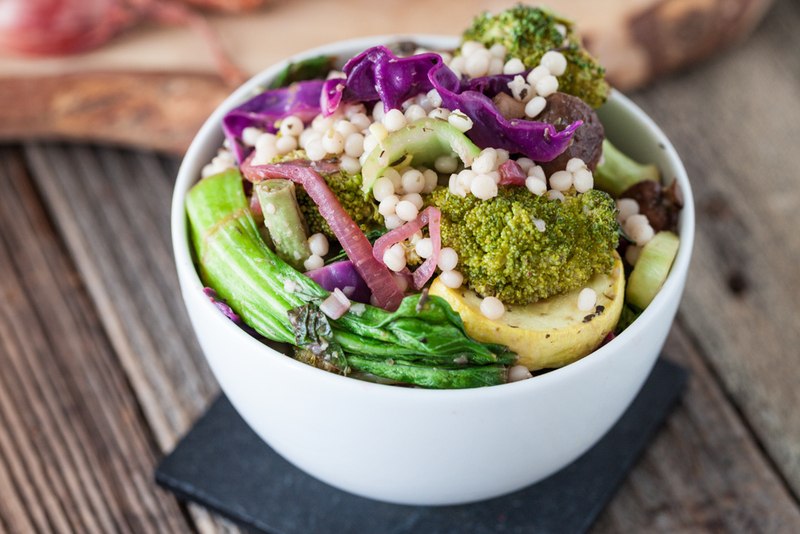 This salad would be great with quinoa, millet, farro, barley, or freekeh (if you have some on hand) but for this version, I chose israeli (or pearl) couscous. I love this chewy little pasta/grain and it worked beautifully in this dish. The star of this meal, though, is the lemon caper dressing. As I mentioned before, it’s stupid easy and this salty, tart dressing adds quite the little “zing” to every bite. If you wanted to add a little bit of protein to the meal, you could easily incorporate some chickpeas or another legume. 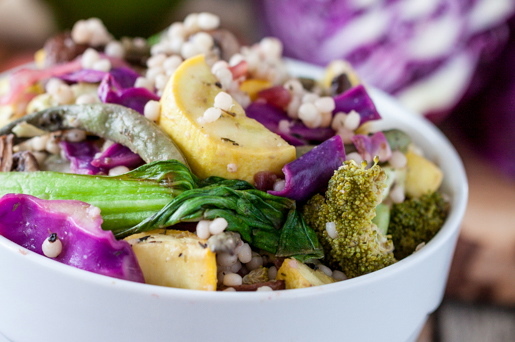 You could also add/substitute other veggies if these don’t float your boat- roasted eggplant, zucchini, cauliflower or even asparagus would all work really well here. This, my friends, is a perfect summer meal because a.) It’s packed with healthy veggies, b.) it’s delicious, and c.) it’s easy to make and comes together very quickly so you I have plenty of time to be lazy. Preheat the oven to 400. Line two baking sheets with parchment paper. Spread the veggies out over the two baking sheets. Lightly spray them with olive oil (or drizzle with olive oil) and sprinkle the herbs. Add salt and pepper to taste. Toss to fully coat. Roast in the oven for 20 minutes, flipping once halfway through. Remove from oven and set aside. Once the veggies are in the oven, you can prepare the couscous. Bring the water to a boil in a large pot. Once it is boiling, add the salt then the couscous. Cover and remove from heat. Let sit for about 15 minutes before checking. At this point, the water should have cooked away and you can fluff the couscous with a fork. If there is still water, cover and let sit until water has cooked away (You may have to drain some of the water at the end). Let sit until ready to use. Combine all of the dressing ingredients in a cup wide enough to fit an immersion blender. Use an immersion blender to puree the capers and blend all of the ingredients together until it is mostly smooth. If you do not have an immersion blender, you can use a blender, but you will likely have to scrape the sides several times until it is mostly smooth. Chill until ready to use. Heat the olive oil in a frying pan over medium heat. Add the shallots and sauté for 2-3 minutes. Add the bok choy and cabbage and sauté until just beginning to wilt. Add salt and pepper to taste and remove from heat. 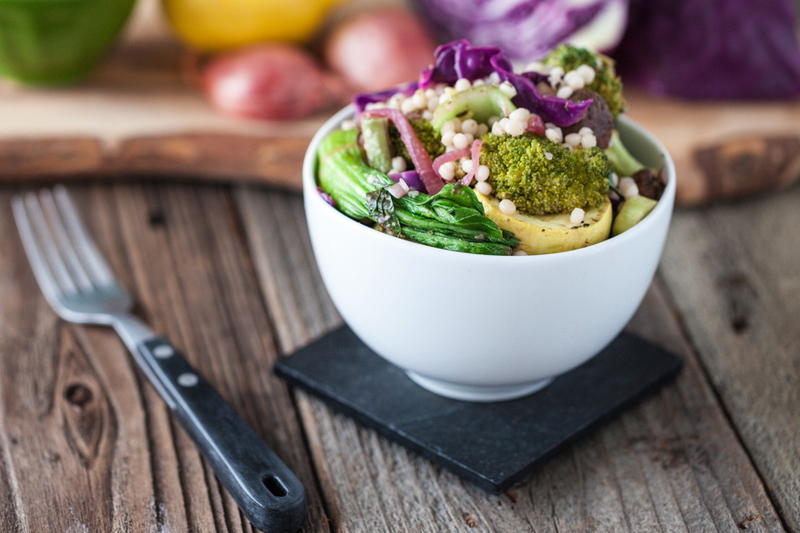 Combine the veggies, the couscous, and the bok choy/cabbage mixture in a large bowl. Give it a couple stirs to incorporate the ingredients a little more. Pour the dressing over the salad (You may need to re-stir the dressing if it has separated at all) and mix until it is all fully combined. Serve immediately. You can make this a day or two ahead of time but you may want to reheat slightly before serving. Enjoy. To view more of Kristy’s incredible creations (these are just some of my favorites), click on any of the following links. I’ve got the lovely Shira from In Pursuit of More guest posting here today. I’ll be honest, I probably cook more off Shira’s blog then I do out of any of the cookbooks in my house. That may have something to do with the fact that we’re a mere 5 days apart in age, us Virgos must have some very similar taste. 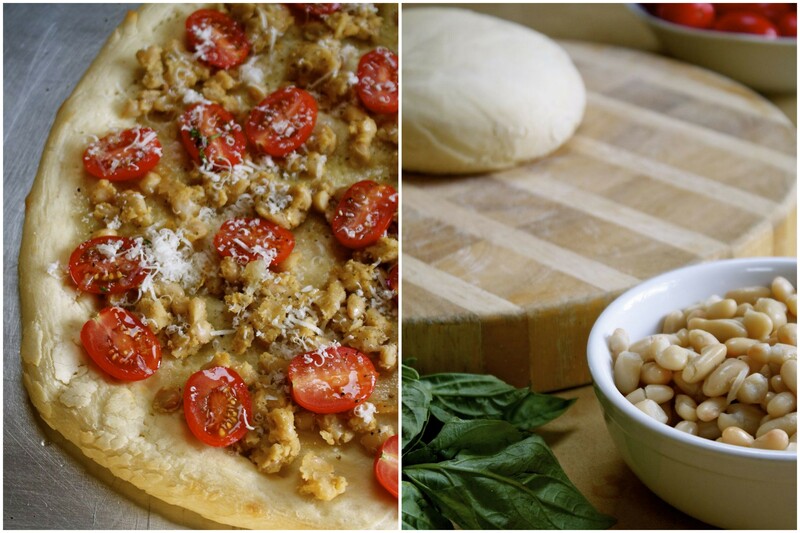 Today she’s brought you this incredible Tuscan White Bean and Basil Pizza. Meet me again at the end of this post for more of my favorites from her site. Howdy Vedged out readers! I’m super thrilled to be sharing a post with Somer’s amazing readers today and hope you guys enjoy this yummy recipe! When a friend reaches out and asks for a hand, there is really only one thing you can do: offer both of yours up and see if there is anyone else out there with a few to spare. I’ve been re-inspired of late by the amazing opportunities we have everyday to make other people feel special, and to literally make their day, or their week, or their year. Of all the good deeds I’ve seen in the past few days, there is one that struck me as particularly potent, especially if we are looking to make a difference in the life of a stranger, and perhaps someone a whole lot less fortunate than we are (on the surface anyway). The other night, me and a girlfriend were ending an evening of wonderful food and drink at a friend’s new restaurant, when, as we walked to my car, we passed a woman about our age pushing a grocery cart. It was raining, the first rain since the start of July, and she was well bundled in fleece, with a hat, and didn’t look like she had anywhere to go. She saw us walking past as there was no one else on the street, and her eyes caught mine. Used to walking past people asking for money (I regularly hand out 5 dollar bills – it just makes me feel good), I naturally assumed she might need/want some cash. But somehow her look that night was different. “Hi”, I said, as I interrupted our chirpy girlfriend chatter, “Is there something you need?”. I rifled through my bag, searching for what I didn’t know. Did I have a bar? A snack? A bill I could spare? She didn’t answer but looked down as if embarrassed and waved both of her hands like she was sorry to interrupt us. We stood there for a split second in the dark night before my gorgeous girlfriend (inside and out) broke the silence with, “Do you need a hug?”. With that, my girlfriend approached her, without giving her the option to decline, and gave her a giant hug. A long hug, the kind you settle into, and the kind that passes energy between two people the way nothing else really can. They both wrapped their arms around each other and shared. It wasn’t a fast hug, or a false hug, or the kind that passes between acquaintances and family as part of obligation, along with all the awkwardness that often goes had in had with those exchanges too. Afterwards, it was my turn, and I nestled into this woman’s fleecy softness and was filled with gratitude for such a sweet, simple exchange of love & kindness. It felt good. Pure. So simple. And so real. A reminder that we are all human, born not of our choosing, and given the freedom to choose our actions every moment of every day no matter what our lot in life. Afterwards, I was on such a high for the gift my friend had given not only the woman we saw on the street, who carried on into the darkness with her cart and hopefully a full heart, but to me too. To realize that human need is so much more than just material, and that those all around us need love & kindness, and the kind you can’t buy with all the spare change in the world. Feeding the heart and soul is every bit as important as keeping our tummies full, and I was reminded of the power we all hold with just a simple extending of our arms. First, prepare the pizza dough in advance according to directions, or use your favorite pre-made dough (I have a fave Italian deli I buy from and keep ’emergency’ dough in my freezer). To create this simple rustic pizza, complete the following steps. 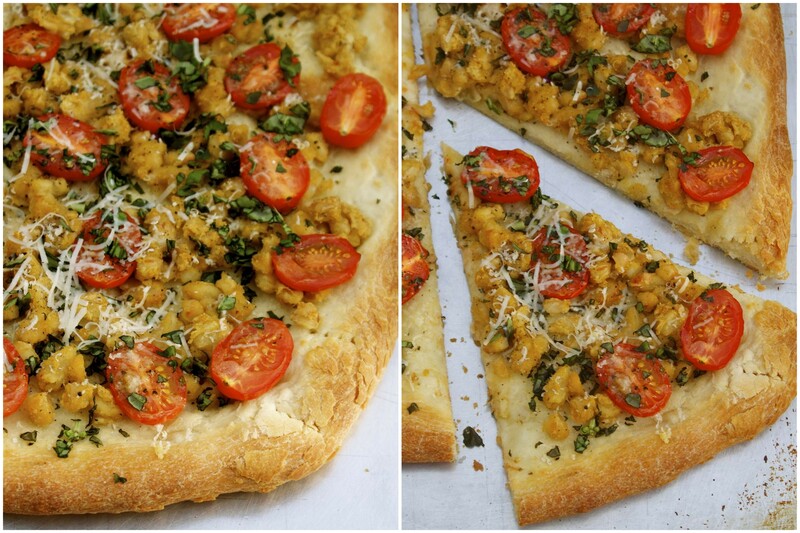 This is a wonderfully simple yet totally fresh take on pizza that I find simple yet still sophisticated. Heat the oven to 450 degrees. Heat the olive oil in a skillet on medium low until warm and add the minced garlic. Cook the garlic, stirring often to keep the garlic from burning. Cook the garlic for 2 minutes, or until golden brown and fragrant. Add the drained beans, about (1/3) cup veggie stock to start and the salt & pepper. Cook this mixture for a few minutes until the stock has evaporated, adding more to achieve a creamy consistency. 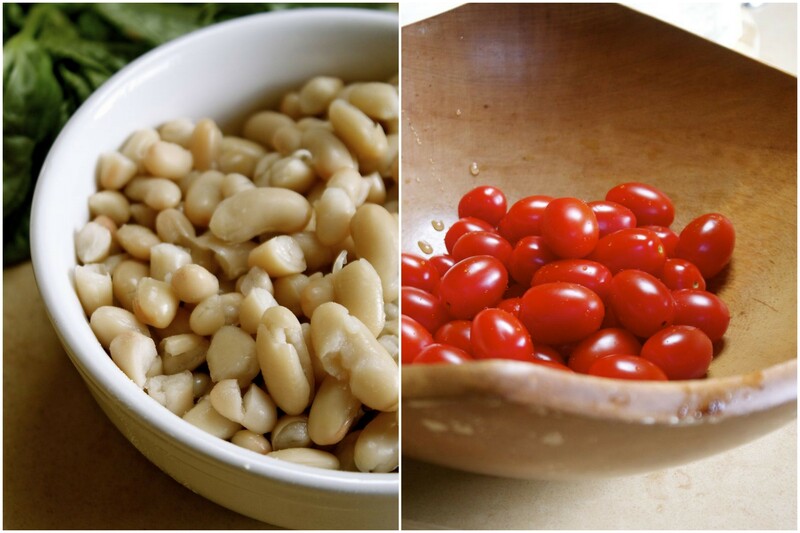 Do this for 10-15 minutes until all the stock has been used and the beans are hot and creamy. Remove from the heat and stir in half the basil. While the beans are simmering, prepare the pizza crust (enough for one pizza). Oil a round or rectangular baking sheet and stretch the dough over the pan. Lightly brush the crust with olive oil and prick here and there with a fork. Cook in the pre-heated oven for 4 minutes. Remove, prick the crust again all over with a fork, and cook for another 4 minutes. Remove the pre-baked crust, and when the beans are ready, spread them evenly over the entire pizza. Place the tomato slices over the top and drizzle with a little more olive oil and black pepper. Cook in the oven for 10-12 minutes until the crust is brown on the edges. 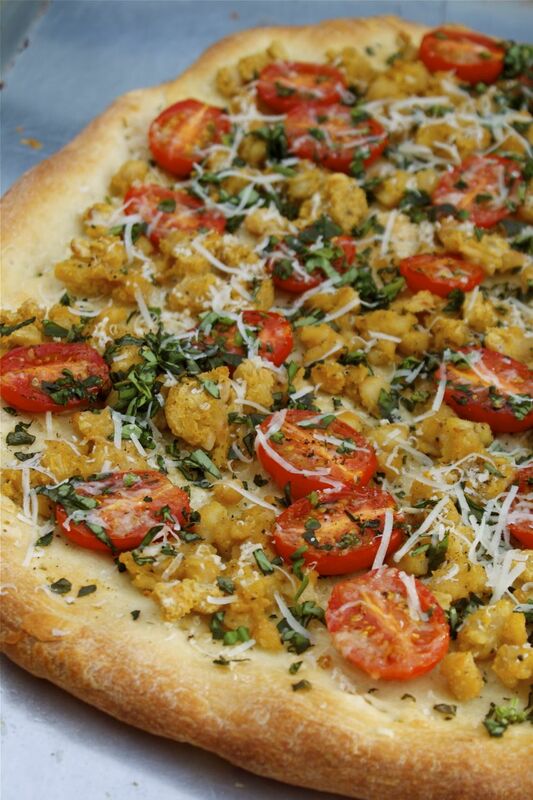 Top with the remaining fresh basil and the Parmesan cheese or vegan cheese topping of your choice. This pizza makes a wonderful first course to a dinner party and offers folks a chance to try something new and delicious over a glass of wine and good conversation. 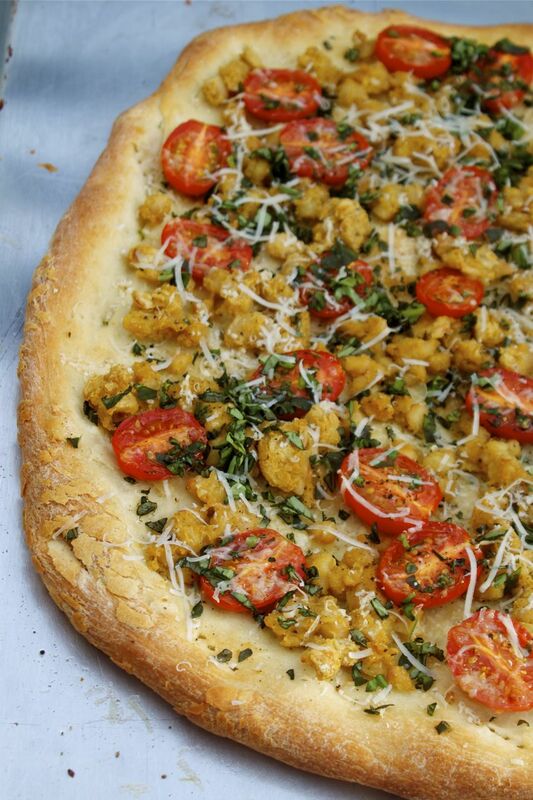 It is beautiful to look at and showcases a good crust and the beautiful flavors of fresh garlic & summer basil. Love and hugs to all, particularly to my dear blogging friend Somer, who asked me so kindly to be here today (insert gratitude here). We all need hugs, whether virtual or otherwise, so do reach out and hug someone today. You never know what’s around the corner, so don’t wait, not ever. The time is now, so reach out and grab it, squeeze it hard, and don’t ever let go. Vegan Madeleines with Citrus and Raspberries! Guest Post from Alexander Willow Harvey at In Vegetables We Trust. Since I’ve spent most of my time this summer on vacation, hanging out with my kids and in Doctor’s offices for my injury, I haven’t been spending as much time as I’d like in the kitchen. So, I’ve asked some of my blogging friends to lend a hand and guest post here. My first guest post is from my friend Alexander at In Vegetables We Trust. (Clockwise) Rainbow Salad, Apple and Parsnip One Pot, Cupcakes with Vegan Honeycomb, Whole grain Pflaumenkuchen – Yeasted Plum Cake, Pumpkin Seed Oatcakes, Coconut Courgette Cake, Olive and Caper Bread, Slow Cooker Chili, Chocolate Chestnut Pies, “Beefy” Lentil and Portabello Stew, Rocket Pesto Cookie Sheet Pizza, Nanaimo Bars. Now for these beautiful Madeleines, they are a small French sponge cake baked in a pan that has shell like depressions. To purchase your very own Madeleine pan, click here. 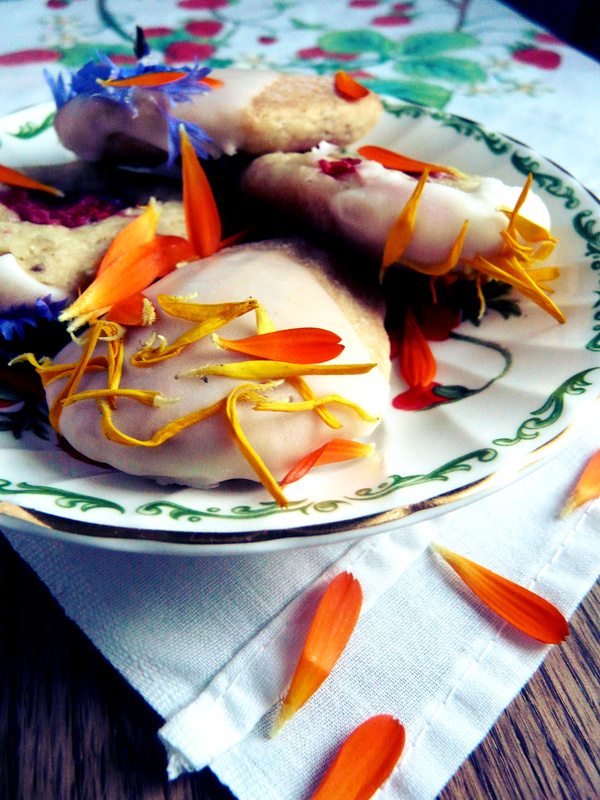 Alexander has been preparing recipes with lots of edible flowers as of late, lucky you! Method: Preheat the oven to 180c/ 360f. Grease a 12 hole madeleine pan and dust with flour, turn upside down and tap out the excess flour. Sift together the four, soy flour and baking powder into a bowl. In a separate bowl beat together the flax-seed, soy milk and lemon juice with a hand mixer for a few minutes until you have worked in some air, add the oil, sugar, lemon zest and vanilla and beat again for a few minutes. Sift in half of the dry ingredients and fold together until just combined. Sift in the other half and fold together until fully incorporated. Scoop the mix into a piping bag, snip off the end and pipe into the madeleine pan (this is the quickest and easiest way) filling them up about 3/4’s of the way. And carefully press a raspberry into the top of each one. Bake for about 10 minutes, turning during baking if your oven is uneven. Once baked remove from the oven and carefully use a spoon to place the hot madeleines on a wire rack to cool, raspberry side up. Allow to cool completely before glazing. To make the glaze carefully combine the lemon juice, soy milk and vanilla with the sifted icing sugar in a bowl, mix nice and slow so as not to get icing sugar every where (I always seem to spill some). 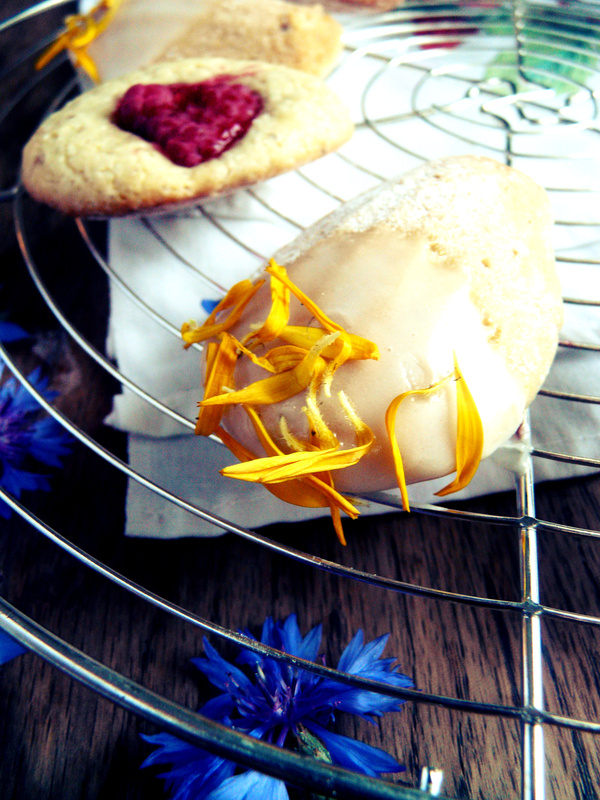 Dip the cooled madeleines in the glaze and place back on the wire rack, sprinkle with edible flower petals and allow to set. Serve with tea.